Today I found out what R.S.V.P. stands for, namely Répondez S’il Vous Plaît, which translates roughly as “please reply” or “reply if it pleases you”. So how did R.S.V.P. make its way into being used for wedding invitations and the like? This dates all the way back to around the 11th century when French became the fashion among the elite of the English court. This continued in England for several hundred years. It was also the fashion in the United States, among high society, to use French as the language of refinement up until around the 19th century. From this, many such similarly themed French phrases and words made their way into English, another example being the word “etiquette” itself. Ironically, the French themselves don’t usually use R.S.V.P. anymore, more typically using Prière de Répondre these days. 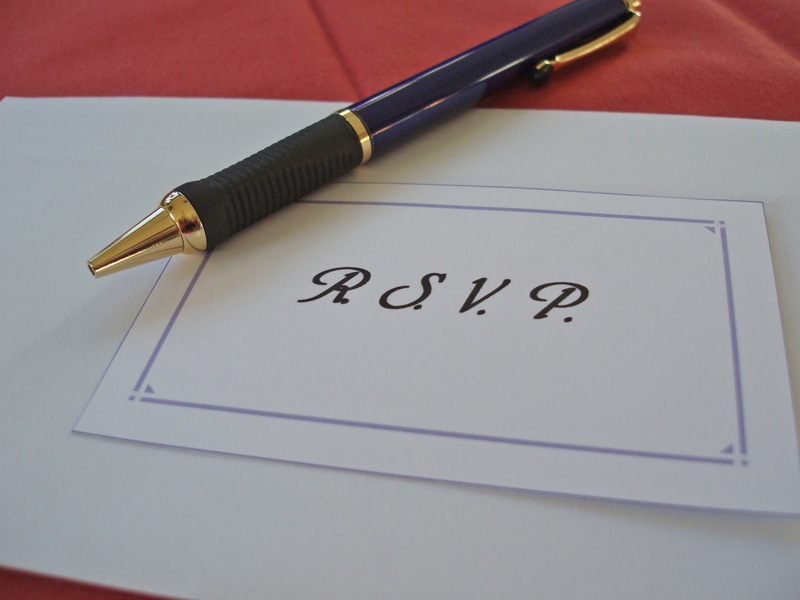 A new trend sweeping the invitation world is to not ask for an R.S.V.P., but rather put a “Regrets Only”, so the inviter will expect you unless you respond checking the “Regrets Only” box. If you don’t respond, they assume you are coming. 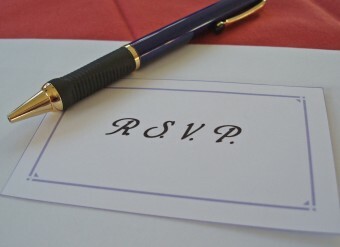 The choice to use periods following the letters in “R.S.V.P.” is somewhat a personal preference today, despite it being an abbreviation. Many guides say periods are necessary because it is an abbreviation, such as AP; others say you should not use them; and still others say it is personal preference. To further cloud the issue, some, like the Chicago Manual of Style, recommend only using periods if the letters are printed in all lower case, otherwise no periods. Etiquette first showed up in English around the 18th century. It derives from the Old French: estiquette, meaning something to the effect of “label or ticket”. Estiquette in turn derives from the Old French: estechier, meaning “to attach or stick”. It is thought that the word “etiquette” came about thanks to King Louis XIV (Louis the Great) who had étiquettes passed out at his palace at Versailles. These étiquettes were basically just little cards that had various reminders written on them like “Ne marchez pas sur l’herbe” (keep off the grass) and other such rules of conduct at the palace. Another in this “gruesome two-some” class among the aristocracy was Queen Isabel I of Spain who once confessed that she had taken a bath only twice in her lifetime, when she was first born and when she got married. I read a joke in Boy’s Life that said it meant “Rush In. Shake Hands. Vanish Promptly.” And that’s what I stuck with for the last 25 years. I’ve thought it to mean rice n stew very plenty.